Did you know Clay Pot cooking goes back thousands of years and was used by most of the early civilizations including the Etruscans, Romans, and Chinese. The clay pot is a wonderful addition to your kitchen for making one-pot meals. Here is a cooking style that allows for cooking just about anything you like slowly and gently while retaining the juices and flavor As a porous material, the clay in a pot that has been saturated with water slowly releases steam from its pores during the cooking process. Juices released by the food as it cooks cannot escape from the pot. This seals in flavor and keeps food from drying out, without the need to add extra fats or liquids. Along with the flavor, essential nutrients and vitamins are retained in the food. Heat wok with a little oil, enough to fry the salted fish. Fry until crispy, remove and set aside. Add in the ginger slices and fry until fragrant. Add in chopped shallots and garlic and fry until sweated and not browned. Heat a claypot over medium high heat. Transfer all the ingredients from the wok to the claypot. Add in water, oyster sauce, chicken stock granules and dark soya sauce. Bring to the boil, and cover with lid and turn heat to low. 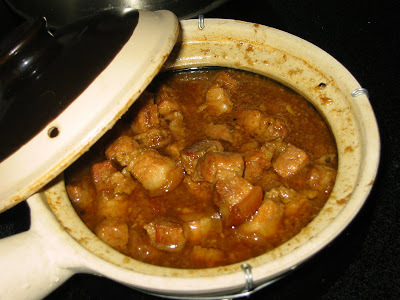 Simmer until pork pieces are tender, stirring and adding water if sauce dries up and pork pieces are not tender yet. Add in the fried salted fish, wine and spring onions (if using). Cook until sauce has thickened. Adjust taste with salt and sugar. Add in pepper and sesame oil before serving hot.